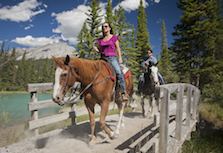 A Brief History Of Horseback Riding In Banff. Horseback riding has deep roots out here. When pioneers first began to explore Western Canada, horses offered the most efficient way to navigate the craggy, steep terrain of the Rockies. They pressed through the unexplored brush to open up new trading routes during the 1800s. But later, horseback riding took on a completely different role. Around the turn of the century, the Canadian Pacific Railway began promoting places like Banff National Park as thrilling Himalayan-like destinations for the world’s most elite travellers. And the well-to-do came in droves. One of the most exciting activities for early 20th century travellers was to venture deep into the backcountry while riding a horse. A route we’ve followed for nearly a century. Trail guides would often take these early travellers on horseback trips to stunning, remote places like Mount Assiniboine. Just imagine wealthy aristocrats being met by rough-and-tumble, bush-hardened wranglers and then exploring spots hardly anyone had seen before. Despite the somewhat rugged trip, travellers loved every minute of it. And then in 1923, a club of 14 backcountry enthusiasts called the Trail Riders of the Canadian Rockies formed. This group helped even more people explore the Banff wilderness. In fact, they followed part of a route similar to the one Banff Trail Riders uses today: starting from just outside of Banff, up Allenby Pass and then towards Mount Assiniboine. That same year, the CPR built the 3-Mile Cabin, which is now used as a shelter by our guests on Cowboy Cookouts, and the 10-Mile Cabin, where the Sundance Lodge now sits. A few years later, in 1928, the Halfway Lodge was built at the base of Allenby Pass. This log cabin served as a stopover for legendary mountain guide, Erling Strom when he took travellers through the wilderness to Mount Assiniboine. And even today, it continues to offer shelter for backcountry adventurers. We could go on and on about the history of this place. But we’d rather tell you about it on a trail ride instead. The Banff Trail Riders story – in a nutshell. So how does Banff Trail Riders fit into this story? It all started in the 1960s. Back then, there were three outfitters based at Warner Stables – where we’re located today. But by the mid-1970s, these businesses consolidated into a single large outfitter: Warner and Mackenzie Outfitting/ Holiday on Horseback. In the 1980s, this new company became the leaseholder for 3-Mile Cabin, 10-Mile Cabin and Halfway Lodge – all three of the iconic stopping points along the exact same trail legends like Erling Strom guided on almost a century ago. And then finally in 2014, Holiday on Horseback became Banff Trail Riders – a new name for a renewed focus on helping travellers explore Banff’s incredible wilderness on horseback. But despite this new moniker, we still take our guests along the same route that the Trail Riders of the Canadian Rockies blazed more than 90 years ago. And we’d love for you to join us some day.